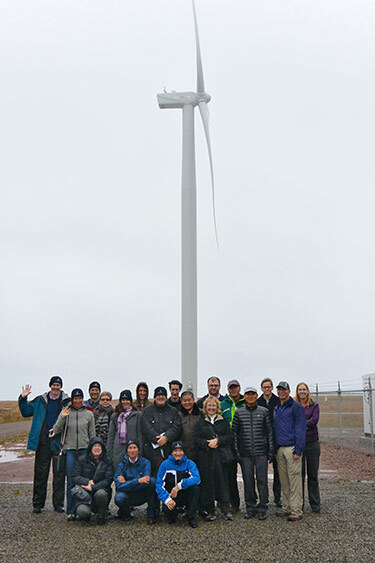 To advance their research program, the Wind Energy Institute of Canada collaborates with many academic institutions throughout Canada and the United States. We value relationships with academia because of the specialized expertise that academics can offer to research problems. Collaboration with professors has mainly taken place through our Visiting Professor and Peer Review Program (VPPP) and through funding from research grants. We are open to new collaborators and continuing research with current and previous collaborators in performing research that follows our mandate. Complied below is a list of collaborators. Measurement of wind speed and turbulence in the presence of wakes and an escarpment. Learn about the Supervisory control and data acquisition systems as well as the hardware and details of operation of the small wind turbine test bed and data logging system being used at WEICan. Focus on their common interest in the areas of wind energy engineering (in particular around asset management and condition monitoring systems) and renewable energy generation. Focus on common interests in the areas of engineering, climate change, and wind energy. Focus on their common interests in the areas of energy storage and wind energy.